If you've been thinking of a career as a sonography tech, there are plenty of high-quality sonography schools in Pennsylvania -- a state brimming with United States history. Attending school in Pennsylvania means you get access to some of the country's best hospitals, medical centers and private practices, offering plenty of opportunity for good-paying jobs and advancement. Diagnostic medical sonographers use imaging equipment to not only assess but help diagnose a range of medical conditions. 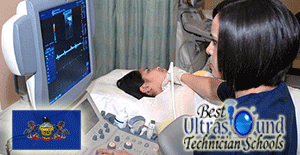 Most sonography tech work within hospitals and medical centers. Although you don't have to be licensed as a sonography tech in the state of Pennsylvania, it's recommended you become certified for access to the best jobs. With certification under your belt, you will have the skills necessary to perform a range of ultrasonography duties. From Penn Medicine to the University of Pennsylvania med school, there are many opportunities after you are certified to hone your skills. Schools within Pennsylvania include Sanford-Brown Institute in Bensalem Township, Northampton County Area Community College in Bethlehem, Misericordia University in Dallas, Harrisburg Area Community College-Harrisburg in Harrisburg, Lancaster General College of Nursing in Lancaster, and Thomas Jefferson University in Philadelphia. If you are searching for ultrasound technician schools in Pittsburgh PA in particular, check out the Community College of Allegheny County, which offers certifications and associates degrees in diagnostic medical sonography and sonographer and ultrasound technician courses. Nearby, Sanford-Brown Institute offers associates degrees in the same fields. Financial aid is available at both schools, with tuition rates varying by commuters or room-in. Sonography tech schools in Philadelphia, the state's biggest city and home to about 1.5 million people. Famed for its pivotal role in the American Revolution, this city served as a central meeting spot for the country's Founding Fathers, and it's where the Declaration of Independence was signed in 1776. You can attend the historic Thomas Jefferson University on Walnut Street, which offers certification and bachelor's degrees in diagnostic medical sonography/sonographer . Financial aid is available and tuition varies on type of program and rooming situation. In your search for quality ultrasound tech schools in PA, you will find many programs to suit your needs, budget and geographical requirements. According to the Bureau of Labor Statistics, diagnostic medical sonographers make a median pay of about $64,380 per year -- nearly $40 per hour. Employment in this sector is projected to grow by 44 percent between now and 2020, a faster-than-average growth across all occupations. This means you can be confident in your quest to become an ultrasound tech in this state, with a demand for jobs that can provide a certain level of job security. Sonography schools in PA can help you prepare for a career in sonography tech, giving you access to the most technologically advanced systems used in the United States. Whether you get an associate’s degree or post-secondary certificate, you'll find that most employers within the state and across the country require professional certification of some kind. Harrisburg Area Community College-Harrisburg 1 HACC Dr.